Perhaps it was fitting that Mountain Falls Golf Course on weekdays is basically a construction site divided by fairways as a new 55-and-over community, Ovation, rises along the holes. Horace Langford Jr./Pahrump Valley Times Pahrump Valley sophomore Haden Wray follows the flight of his tee shot Thursday, March 8, during the first round of the Pahrump Valley Invitational at Mountain Falls Golf Course. Horace Langford Jr./Pahrump Valley Times Pahrump Valley junior Trevyn Wombaker sliced 12 strokes off his score between the first and second days of the 29th Pahrump Valley Invitational held March 8-9 at Mountain Falls Golf Course. 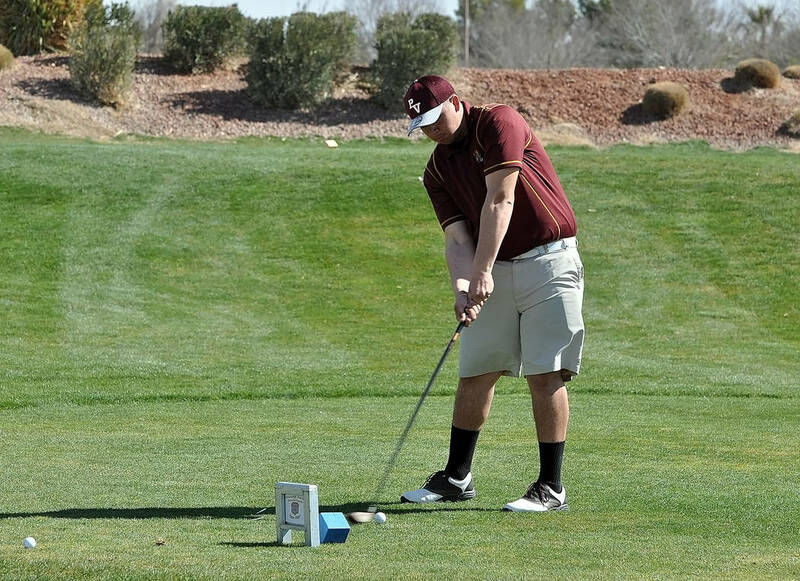 The steady sound of heavy machinery adjacent to the first few holes followed by the sounds of hammers hitting nails and the smell of fresh lumber toward the end of the front nine were symbolic of Pahrump Valley’s golf team, which is indeed a work in progress. The numbers show that the Trojans finished next-to-last out of 18 teams at the 29th Pahrump Valley Invitational, held March 8-9 at Mountain Falls, but the story is not quite as bleak as that. 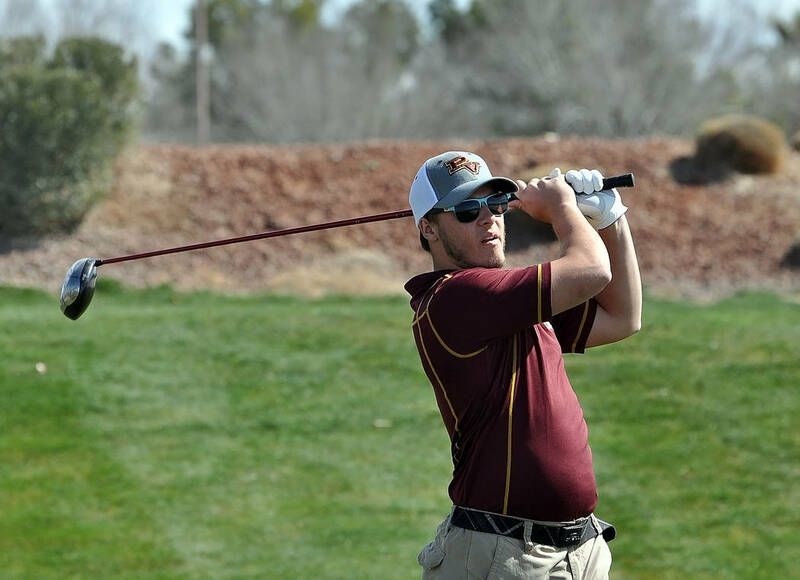 Only one of the three returning Pahrump Valley golfers who competed in the state tournament last year finished the tournament. Senior Mike McDougal, a two-time letter winner, missed the event because of illness, and senior Craig Moore had to pull out before finishing his second round. Moore had the second-best Pahrump Valley score on the first day, carding a 99 that included a birdie on No. 3. Sophomore Koby Lindberg paced the Trojans on Thursday with an 89. Lindberg’s two-day total of 184 led the Trojans, followed by junior Trevyn Wombaker’s 194. Wombaker cut 12 strokes off of his score from Thursday to Friday. Also improving from the first to second round was sophomore Haden Wray, who cut 13 strokes off of his score Friday and finished at 219. Junior Caleb Sproul had similar rounds, scoring the same on the front nine both days and playing one stroke better on the back nine Thursday to wind up at 211. So while the overall score was unimpressive, there is no reason to hit the panic button, according to Hopkins. “I think we got some valuable experience,” the veteran coach said. “We just want to try and get better each time we play. I think we were getting better (Friday). Foothill’s Noah MacFawn birdied a playoff hole Friday to win the individual title after he and Arbor View’s Hazen Newman each shot a 36-hole total of 1-over-par 143. Bellarmine of California placed all four of its scoring golfers in the top 12 to win the team title with a 595 total. Coronado (604) was second, and Arbor View (614) took third.